Kindergartner Silas Kuenzi, left, and first grader Kyler Nuttman of Evergreen School dissect a squid in their science studies last fall. Neighboring Silver Falls and Mt. 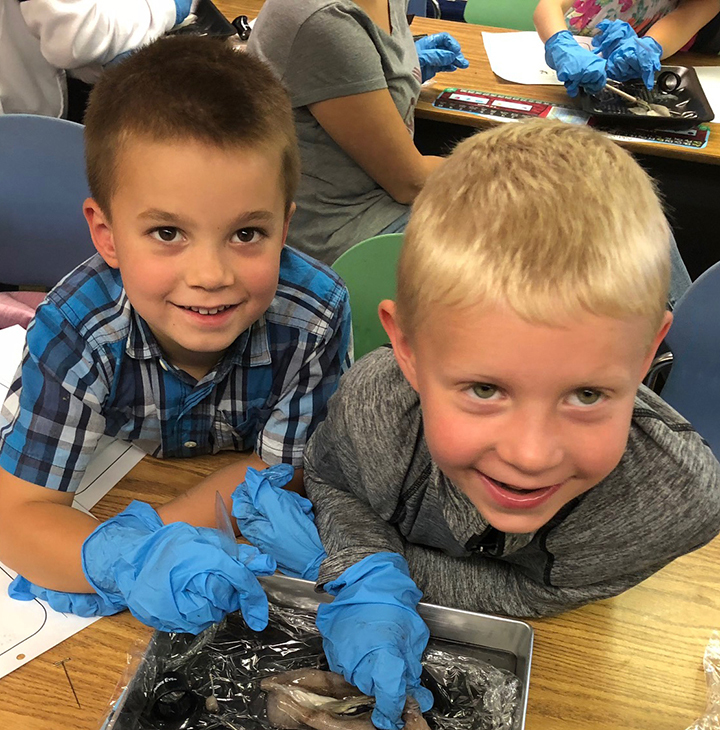 Angel school districts received exceptional rankings in Niche.com’s 2019 Best School Districts in Oregon. Out of 198 school districts in Oregon, Silver Falls ranked 7th and Mt. Angel 19th by the Pittsburgh-based data, ranking and review site for K-12 schools, colleges and neighborhoods around the country. He attributes the stellar ranking to the district’s consistency and persistence in school improvement in general and a penchant to serve each and every student in every one of its 13 schools spread over 250 square miles. In total the district has 3,838 students with a student-teacher ratio of 20:1. He said all district decisions and responses to problems are weighed against whether it will move the district closer to its vision of a 100 percent graduation rate. This year, in response to a known need, Silver Falls significantly extended its counseling program; now each school has an assigned counselor. “Mental health is very important to everybody,” McElfresh said. Mt. Angel School District is composed of 708 students with a student-teacher ratio of 16:1. It is nestled in a small, tight-knit community that puts a lot of emphasis on involvement and volunteerism. “We have a really strong community base of supporters for just about anything and we try to help; for instance, releasing kids to help set up for Oktoberfest,” Stoops said. “We’re not a union district which has given us some flexibility. Our staff is really happy at where they’re at and we like to think that we have a relationship with every kid; that we know every kid individually; that’s our goal anyway. The district implements the AVID (Advancement Via Individual Determination) program, a nonprofit organization that provides professional learning for educators to improve college readiness for all students. Mt. Angel also puts a lot of emphasis on Career & Technical Education programs and getting kids involved in workplace experiences. Like Silver Falls, the Mt. Angel district is making a concerted effort to address the social-emotional side of learning and in the past year the entire staff attended QPR (Question, Persuade and Refer) suicide prevention training. Stoops says a school district is not measured by test scores alone and appreciates that this survey takes into consideration the many other areas that make up its effectiveness. Using algorithms and statistical techniques, Niche analyzes an array of factors that includes test scores, graduation rates, college readiness, student life data from the US Department of Education, and online feedback from Niche users; primarily students, alumni and staff.